Perfect to celebrate the new baseball season, here is the life and famous words, such as "it ain't over till it's over," of Major League Baseball player and New York Yankee Lawrence "Yogi" Berra. Yogi Berra loved his family, his neighborhood, his friends, and, most of all, baseball. He was crazy for it, ever since he was a young kid playing with friends in an abandoned dump. But baseball didn't love him back--at least not at first. Yogi was different. He didn't have the right look. When he finally made it to the major leagues, Yogi faced pranks and harassment from players, sportswriters, and fans. Their words hurt, but they made Yogi determined to show all that he could do. 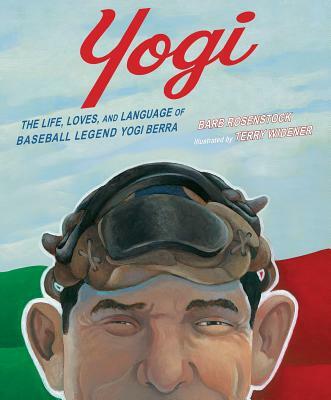 Author Barb Rosenstock's dynamic text and illustrator Terry Widener's powerful artwork reveal the talents, loves, and inspirational words of this celebrated New York Yankee and American icon, who earned a World Series ring for each finger and made baseball love him back. Barb Rosenstock is best known for her many picture book biographies, including Thomas Jefferson Builds a Library, Ben Franklin's Big Splash, The Streak, Dorothea's Eyes, and Blue Grass Boy, all published by Calkins Creek. Her other recent titles include a picture book about Vincent Van Gogh, Vincent Can't Sleep, and a picture book about Vasily Kandinsky, The Noisy Paint Box, which won the 2015 Caldecott Honor Medal. She lives outside Chicago with her family. Visit her at barbrosenstock.com. Terry Widener is the award-winning illustrator of many picture books on athletes, including The Streak: How Joe DiMaggio Became America's Hero, Girl Wonder: A Baseball Story in Nine Innings, American Champion Swimmer: Gertrude Ederle, and Lou Gehrig, The Luckiest Man. He is also the illustrator of The Kite That Bridged Two Nations by Alexis O'Neill. He lives in McKinney, Texas, with his wife and is the father of three grown children. Visit him at terrywidenerart.com.